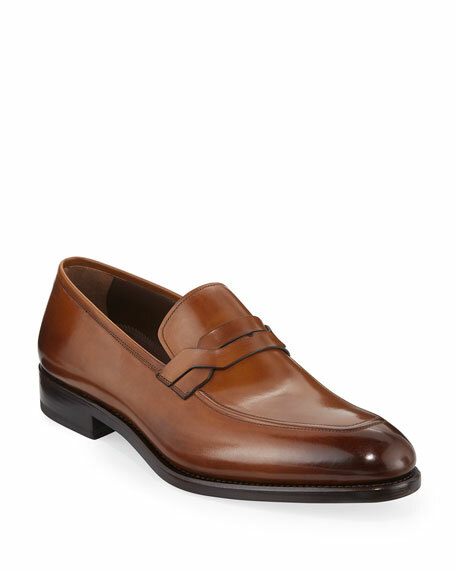 Salvatore Ferragamo loafer in burnished calf leather. A traditional handcrafting process, Tramezza is used to make a variety of different shoe models that hold their shape over time, with a perfect alignment of sole and upper. This complex process includes 320 separate stages and over four hours of manual crafting by expert cobblers for a durable, resistant shoe of unparalleled flexibility and comfort. Tramezza shoes are fine works of art that last over time. Salvatore Ferragamo loafers in goat leather and python snakeskin. Stacked heel. Round apron toe. Metallic horsebit detail across vamp. Hidden stretch-panel at vamp. Slip-on style. Leather lining. "Anderson 2" is made in Italy. Python cannot be sold or shipped to California. Salvatore Ferragamo loafer in dyed crocodile (Venezuela). Apron toe. Brass Gancini bit strap across vamp. Leather lining and insole. Flat stacked heel. Made in Italy. 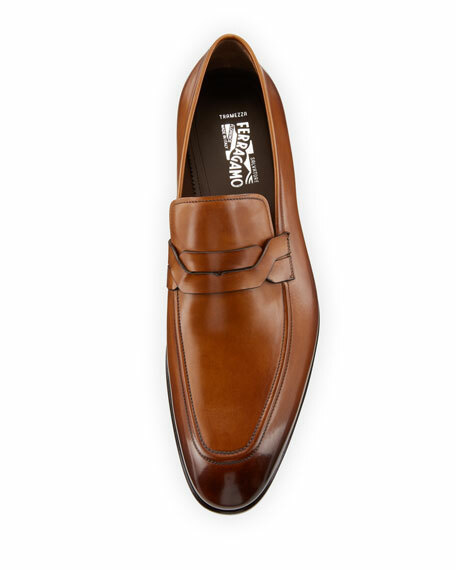 Salvatore Ferragamo loafer in calf leather. Moc toe with tonal topstitching. Silvertone logo-engraved Gancini bit across vamp. Pull tab at back heel. Lugged rubber outsole. Slip-on style. Made in Italy. Salvatore Ferragamo loafer in smooth calfskin leather. Tapered apron toe. Golden twisting Gancini bit strap across notched vamp. Leather lining and insole. Comfort rubber outsole. Flat stacked heel. Slip-on style. Made in Italy.